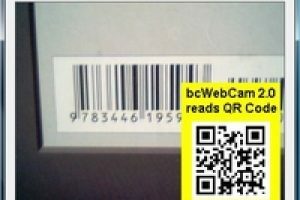 Use webcam to read barcodes"
Barcodes have a wide range of uses. The can be used to collect data such as pricing or inventory information. They also make tracking and storing of inventory information easier. Reading of barcodes using a PC webcam is quite impossible unless you have a dedicated barcode scanner. 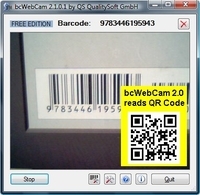 But there numerous tools available on the market which through your PC webcam can accurately scan and read barcodes. The application provides support for various barcodes. You can also configure the angle of rotation, checksum, maximum skew angle or inclination and length parameters. Once it detects the barcodes, it will automatically decode them and display their information in the dedicated box in the main window. It can detect or read GS1, 2-D, EAN, 2/5, Code39, Code 93, UPC, QR Codes and more types of barcodes. It is able to read barcodes directly from objects, images, web pages, print or soft documents. The application uses the Windows Driver Architecture, allowing it to offer support for a wide range of webcams. This application makes it possible for users to easily scan and read barcodes at their own convenience using their PC webcam. bcWebCam is licensed as freeware for PC or laptop with Windows 32 bit and 64 bit operating system. It is in inventory & barcoding category and is available to all software users as a free download.